Later this year, freight trains will again run through the Rogue Valley south to markets in California. The improved efficiency of transporting materials and products will, undoubtedly, provide a significant economic benefit to our regional economy. Trains over the Siskiyou Pass stopped back in 2008. With the support of The Chamber of Medford/Jackson County and other private and public stakeholders in Oregon and California, a $7.1 million federal grant was secured for the rebuilding project. Private industry added an additional $6.2 million for construction. While the Siskiyou Rail Line runs from Weed, Calif. to Eugene, the repair effort focused on a 65-mile section, installing new rails and ties as well as repairing 32 bridges and one tunnel. Reopening this section of the Siskiyou Rail Line will mean locally-produced goods in southern Oregon, such as lumber and other wood products, can be shipped via freight rail and connected with the Union Pacific in northern California to journey further toward national and world markets. The shipping time saved versus the trip north to Eugene helps our local manufacturers stay competitive. Additionally, reopening the rail line to California affords our major employers in Medford, Grants Pass and further north the flexibility to ship finished goods. For example, Combined Transport has a trans load facility at its property north of Central Point near Interstate 5 and Exit 35. The trans load facility was constructed with ConnectOregon grants along the Central Oregon and Pacific rail line to allow manufacturers the ability to transfer shipments by either truck or rail, providing an added economic advantage of getting products to market by different modes. Amy’s Kitchen is experimenting with more shipments via the trans load facility. The trucking industry is critically important to our region’s economy, but, even companies like Combined Transport recognizes that transporting goods by rail can be more efficient than by truck since one rail car carries the equivalent of 3.5 trucks worth of cargo. As trucking costs are projected to significantly increase, the added utility and cost savings of freight rail will open up more capacity on our roads and highways. A safe and efficient transportation system has long been one of the key areas of interest for The Medford/Jackson County Chamber of Commerce. We see a good transportation system serving more than just the economic life blood of our economy. It’s also integral to making our valley more livable. Over the last decade and a half, more than a quarter billion dollars of transportation projects were built in the Rogue Valley. 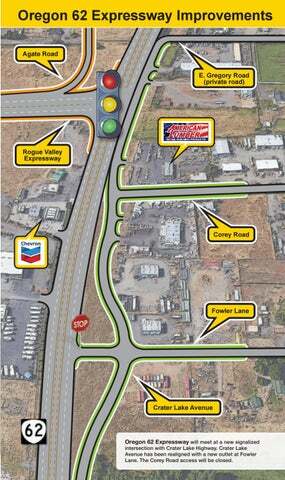 The Chamber continues to be an advocate for continued transportation investment and infrastructure in southern Oregon. The Siskiyou Rail Line rehabilitation project is one of the much-needed investments in addition to the Fern Valley Interchange project and the Oregon 62 Expressway project that ensures our region’s economic success. Brad Hicks, Certified Chamber Executive, currently serves as President and CEO of The Chamber of Medford/Jackson County. He earned a Bachelor’s degree in political science from Southern Oregon University and after service as a legislative assistant to three Oregon state legislators and one United States congressman, Hicks returned home to southern Oregon and in 1993 and began his career in chamber of commerce management. Hicks has devoted much of his career to transportation advocacy. He served on the Jackson County Airport Advisory Committee and as the chair of TRADCO for nearly a decade. Hicks was appointed by the Governor to the Transportation Governance Committee in 2014 and reappointed in 2015, which was created to prepare Oregon for a discussion about the need for increased transportation funding in our state.